Dr. Henderson is Executive Director of the Memory Keepers Medical Discovery Team on Health Disparities at the University of Minnesota Medical School, Duluth campus. He is Oklahoma Choctaw. Dr. Henderson's research areas focus on dementia and diabetes among American Indian people. Specifically, his work is on dementia and diabetes as an interactive syndrome, biological and cultural influences regarding recognition and treatment of dementia and diabetes, cultural constructions of disease, and community health interventions and education in the context of cultural diversity. 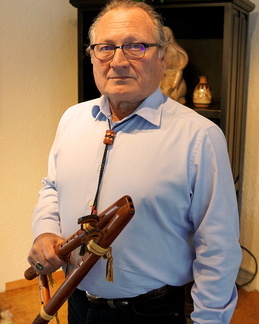 He has conducted bio-cultural research on Alzheimer's disease in American Indian tribes, developed Alzheimer's support groups in African-American and Spanish-speaking populations, and conducted geriatric health care education for American Indian providers across the United States. The themes of this research are the prevention of disease, reduction of health disparities, and the building of healthier lives among the youth, adults, and elders in culturally diverse populations. Dr. Henderson was honored by the award of the Leadership in Prevention for Native Americans, 2006, by the Loma Linda University School of Public Health and the Award of Achievement by the University of Oklahoma, College of Public Health. Dr. Henderson is the former Editor-in-Chief of the Journal of Cross-Cultural Gerontology and past-President of the Association for Anthropology and Gerontology. He has authored many articles in the scientific press and is co-author of the textbook, Social and Behavioral Foundations of Public Health (2001) and, with Maria Vesperi, is senior editor of The Culture of Long Term Care (1995).